It truly does not count if you are a professional or a beginner; thanks to Raptivity, you don’t require any programming or technical skills to wow your learners. 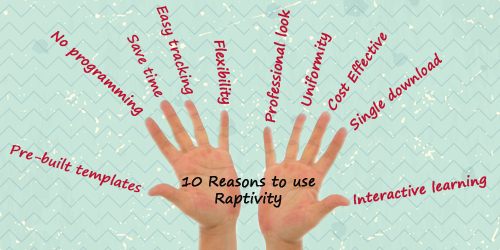 Here are ten reasons I feel Raptivity is a must have for every learning professional. 1. Pre-built templatesRaptivity comes with a library of 190+ pre-built templates across categories like games, simulations, brainteasers, interactive diagrams, virtual worlds and many more. These can be used to create stand-alone learning objects or can be easily embedded into your favorite tool, like PowerPoint, Articulate Storyline, Lectora, Claro, Captivate and many more. 2. Increased flexibilityRaptivity interaction templates are very flexible, easily editable and can be customized as per your requirements. Gone are the days when you open a tool and start building an engaging interaction from scratch. Today, Raptivity templates are proving to be a boon for eLearning professionals. Raptivity’s ultimate objective is to help you get started with the best suited interaction template in minutes. Regardless of the training efforts you take to inculcate eLearning tools’ knowledge in your staff, often staff which is not tech savvy is left out. Raptivity comes across as a blessing. NO programming skills required at all! Raptivity ensures that your learning material becomes very interactive and demands the learner’s involvement. Minimal browsing through the content is required since the learner will not move ahead until s(he) has performed the required activity. Raptivity helps you bind your learners throughout the course. Not all of us have a graphic designer at our reach; hence we have to depend on external help. Raptivity eases this for you with merely 3 to 4 clicks. No or minimal help from graphic designer is required to build content in Raptivity. This helps you focus on the course content rather than how to make it look good. Just a single click download is required to install Raptivity and you are all set to start working on your projects. It also provides you with a pre-built image gallery (buttons, backgrounds and characters) that can be used at no extra cost. Uniformity/Standardization is a crucial part of any course. Consistency in the course layout helps learners to navigate and use the course effectively. Raptivity supports global settings to standardize course: colors, fonts, sizes, and layout in merely a click. Create effective, engaging and amazing courses— all with no dependency on programmers, easy integration with your favorite authoring tools, the vast variety of templates to choose from and support for both Flash and HTML5: Raptivity cost is definitely justified. So what are you waiting for? Download Raptivity today and take advantage of its vast interaction library and astounding functionalities right away. 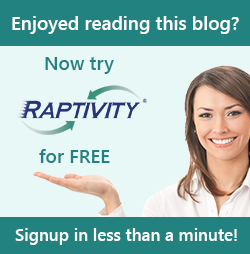 Note: This blog has been posted by Raptivity Marketing Team on behalf of Magdalene.